Limited edition statue of Mad Titan Thanos. Inspired by the art of Skottie Young. 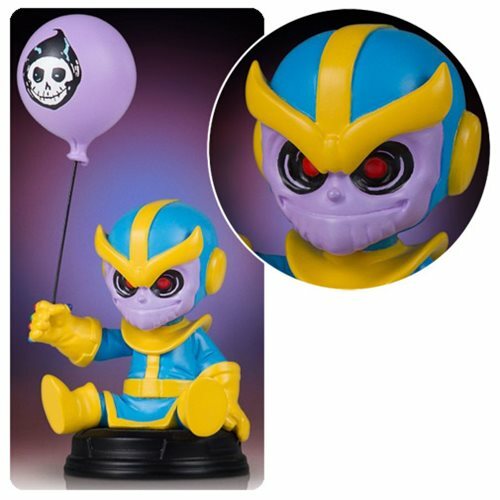 This adorable 5 3/4-inch tall Thanos Marvel Skottie Young Animated Statue is the next statue in Gentle Giant Ltd.'s animated-style Marvel statues. The appealing collectible was digitally sculpted and then printed on state-of-the-art 3-D printers. The 3-D prints were then used to create the prototypes needed to produce this fun-filled statue of the love-starved Mad Titan - Thanos! The animated design is inspired by the art of Skottie Young, found in the pages and covers of Marvel Comics. With balloon in hand, Death's Suitor is a limited edition of 3,000 pieces. Ages 13 and up.